The Apples are Coming! Does this sound like a grade B movie? With the abundance of apples in the city and the struggle of know what to do with them all, it feels like a pretty scary event to all of us at Fruits of Sherbrooke. We have been making jams and jellies and even some popular sauces with local apples, but we are always overwhelmed with the bounty that is available. In 2013 we diverted over 8,000 kg of apples to charities, food banks and community kitchens and resources in the month of September and then we just lost count!! This year we have increased our list of charities, not for profit groups, community projects and even some small businesses that will take all the apples we can direct to them. We know this will only address a portion of the apples but it is a definite improvement over the past when they ended up in the garbage. If you can pick them, give us a call and we will direct you where they can go. Some operations will come and pick them up, while some of the charities and food banks ask that you deliver them directly to them. This works as you will see who will be using them and have the satisfaction of knowing they will be used for food. We do ask that you call us first as we operate a clearing house operation to make sure that none of the recipients become overwhelmed and that others do not get forgotten. We appreciate your efforts in helping us in this initiative. 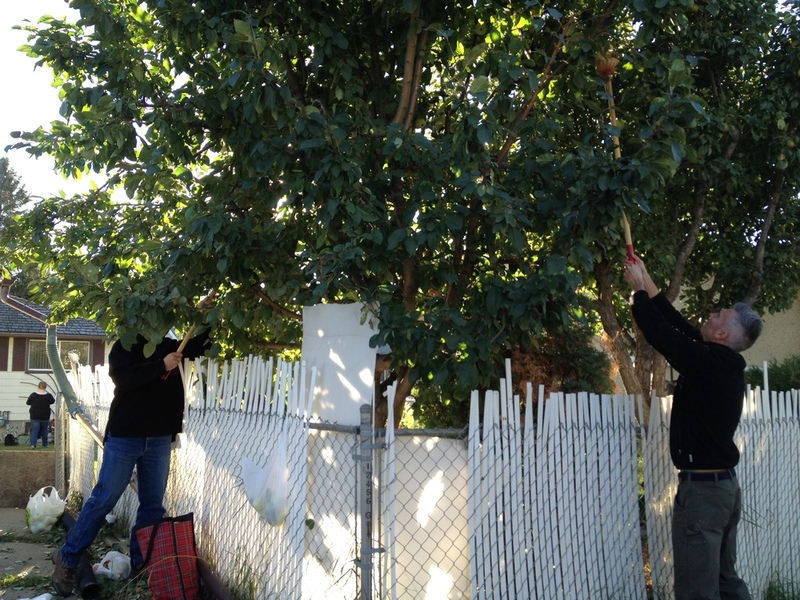 If you are unable to pick the apples, contact Operation Fruit Rescue and register your tree. If they have enough volunteers they will come and pick it for you. If this does not work and you are willing to let others in your yard, we might be able to connect with new Canadians who are willing to pick for themselves. To assist individuals in knowing what to do with them, we are offering a series of classes on Apples and ideas of how to preserve them for winter use. In addition, OFRE (Operation Fruit Rescue Edmonton) will also have a series of events where they will bring their apple press and demonstrate the making of apple cider. Watch their website for details. For information on our Apples! Apples! Apples! Classes click here for details. In September we were visited by a team of 5 great volunteers from Northlands who gave us their volunteer day. It was a fun experience for Fruits of Sherbrooke and we welcome other teams to consider this as a unique team building experience. Below is their story. 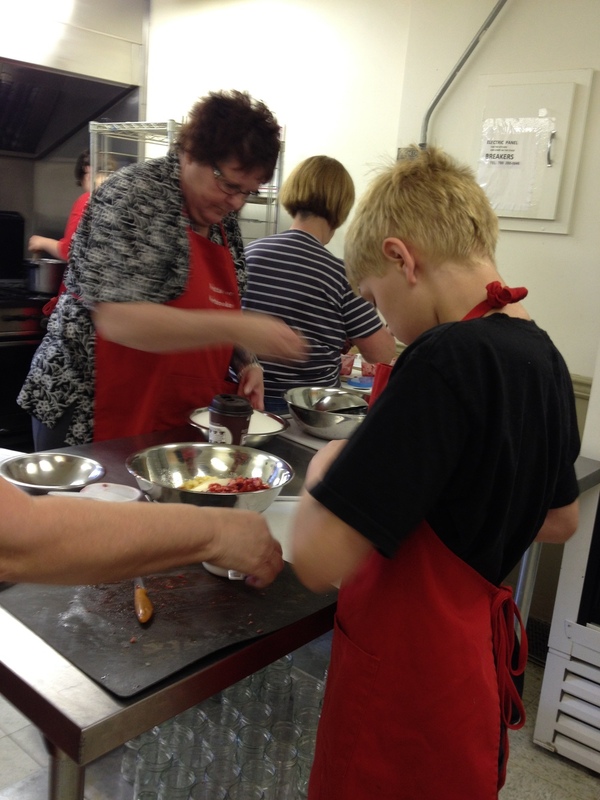 "The Northlands Agriculture Department spent our “Day of Sharing” with Fruits of Sherbrooke. Fruits of Sherbrooke was a great team building experience and we had a ton of fun. Carol and Christina were awesome to work with. Our volunteer day was designed really well. We managed to see the entire production process including picking the fruit, juicing, making jam and jelly and canning the final product. We had an opportunity to help design a new flavour and hear the story about where the jam we were making would go. It is exciting to see a thriving urban agriculture project that delivers interesting and flavorful jams and condiments; while delivering great community benefits and preventing local fruit from being wasted. Jessie Radies, Local Food Associate"